Rest In Peace sweet Dalton. No more pills and poking. 😢. Dillon is waiting for you at the bridge. Little Rocky Rockruff was only in my life about two weeks, but it felt like we had always known each other. I fell in love with him from the very beginning. 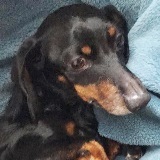 He was the sweetest and most loving little dog to grace my life for those few days. He was very sick but always happy. Everywhere I went, he was right behind me. I took him to the groomer to get his hair cut as it was kind of raggedy, and I stayed with him the whole time. He never took his eyes off of me, as if to say "Please don't go". The groomer was impressed at what a good boy he was. When I took him in my arms he was so soft, I called him "Woolly Bear". Thursday night he was coughing all night. We went to the vet first thing in the morning but my little Woolly Bear died in route to the vet. I am devastated by his sudden loss,but I know he is now free of pain. He will forever live in my heart. I love you Woolly Bear. You left a huge hole in my heart, but I know one day we'll meet again. Until then run and play at the Rainbow Bridge. 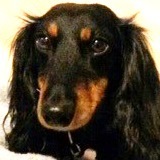 Our hearts go out to Micheline for the loss of her sweet foster, Woolly Bear. Sweet Vinnie came to DREAM because his guardian could not afford the medical care he needed. He had a urinary infection and had not eaten in a week. It turned out that Vinnie had an enlarged, abscessed prostate which was blocking urine flow. Antibiotics and steroids didn't help, and Vinnie continued to get worse. Our vet suspected cancer and recommended humane euthanasia. 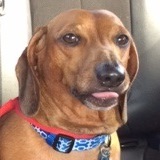 Run free over Rainbow Bridge, little Vinnie. 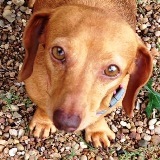 We lost poor Chloe to caval syndrome, a serious complication of chronic heartworm disease. Sweet Anthony Aruba had it rough. How rough, we will never know because he came to DREAM as an outreach from an area shelter volunteer. It seems someone had witnessed Anthony being thrown from a vehicle. A Good Samaritan stopped to scoop him up rather than leave him to die alone in the heat, and took him to the area shelter. Initial observations indicated that sadly, he had probably been suffering for an extended period of time. 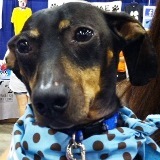 Even though funds were low and foster space virtually non-existent, this little life mattered and so Anthony became a DREAM Dachsie. He was immediately transported to one of our veterinary clinics, but the examination revealed much more sadness than we had anticipated. 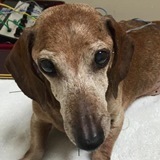 The vet report indicated that our sweet Anthony was in shocking condition. He was completely paralyzed (from an old injury) with absolutely no feeling at all in his back legs, He had a very severe heart murmur which in itself carried detrimental consequences. He had a horrendous skin infection with sores on his legs, belly, chest and neck, a serious eye infection in both eyes, ear infections, and markers that indicated his kidneys were also in dire condition. This poor little man had no control of his bodily functions and was continually eliminating with no ability to hold it. Our veterinarian believed that more than likely, Anthony had been dragging himself around a very long time and while he would have liked to hold out hope that Anthony could find some form of quality of life, his anguish was, that he could not "fix" this boy to even give him a short time of such. Many tears were shed and prayers were prayed for Anthony Aruba. 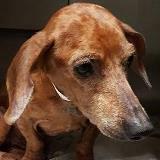 Love brought him to DREAM Dachshund Rescue and our love and desire to help him out of his pain and suffering also allowed that love to help him rest. 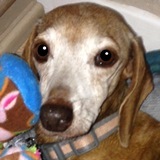 Anthony crossed over the Rainbow Bridge at 6:55 pm in the caring arms of one of our DREAM volunteers who held him tight as she whispered to him that he was a DREAM Dachsie, always would be a DREAM Dachsie and that he was loved more than he could have ever known. Rest in peace little Anthony Aruba. I wanted to thank you for giving me the chance to love and care for Caramel. I know it was difficult for her foster mom to let her go. I tried to send updates on occasion. I hated to have to tell her the bad news. Caramel was a fighter. She was also very loving. It's kind of a funny story how Caramel came into my life. I was at her foster mom's house to adopt Bobo, and Caramel just wanted in my lap. I played with her and petted her. She chose me. I guess she knew she would get everything she needed and wanted. I wanted to adopt her with Bobo, but she was still having medical issues and was not yet available to adopt. When she was finally treated for all her issues, I was told that she would not be adoptable. I was heartbroken since I fell in love with her the first time met her. In August I received a message from hr foster asking if I still wanted Caramel. My reply was "When can I come get her?!" The very next day Caramel came to my house to join my other seniors. She was my smallest, but had the attitude that she was the boss. 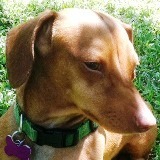 I thank DREAM and her foster mom for giving me the opportunity to adopt little Caramel. I miss her very much. 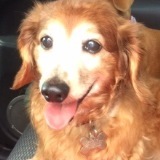 I cannot replace her, but I'd like to give another senior a second chance to feel loved and just a bit spoiled. It was just two weeks shy of a year since Harvey first came to live with us, but it felt like he was with us much longer. We miss him terribly, but know that he is at peace. Friday was a good day for him, he ate with a great appetite and wandered around the backyard with his brothers and sister. That’s what we will remember. I wanted to send you a picture of Harvey doing what he loved best - sleeping! He used to ‘talk’ in his sleep and move his legs like he was on a great adventure. He must have been dreaming about his days as a young pup. It is with a heavy heart I inform you all that Heidi passed away this evening from unknown illness. I am in shock and I can not stop crying. I have no idea what made her sick but she went down hill and I had to make the decision to stop her pain. Please pray for her and the other members of my family. 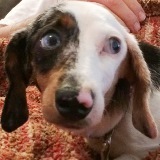 The DREAM family is mourning the passing of our sweet rescued foster dog, Damon Dagobah. Damon was found this past New Year’s Eve by a young college student who knew that NYE is the night most dogs go missing… when they are frightened by fireworks. He posted several found notices on his personal Facebook page and elsewhere, but no one contacted this considerate young man about Damon. When it was time to return to school, he reached out to DREAM for rescue assistance, as his family was unable to keep Damon. 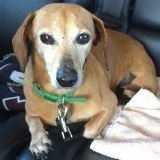 This easy going, sweet senior soul was a happy fellow who loved snoozing and snuggling on the couch. Please say a prayer for Damon, for all the DREAM volunteers involved in his rescue and for his foster mom who is also grieving our family’s sorrowful loss! 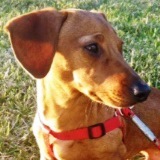 Run free sweet Damon and know that you were a dearly loved DREAM Dachsie! Thanks for all your prayers. Sweet little Chandler was too weak to fight anymore. His foster stayed with him while he crossed Rainbow Bridge. Absolutely heartbreaking. 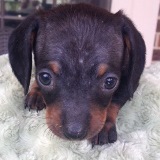 We lost Chandler to Parvo, a horrible virus that could have been easily prevented with a vaccination. It is with a very heavy heart that I have to say that Georgia Peach passed away yesterday. It was totally unexpected. She wasn't showing any signs that something was wrong until 1:00 pm yesterday. She started vomiting and then she just laid down and didn't want to get up. I rushed her to the vet and they did blood work and found that her liver enzymes were elevated. They put her on an IV to try and flush out her system in case it was something she ate. I left her there so they could monitor her overnight, but they called me at 5:00 pm and said that she had passed. They said that she started going down quickly as she was having trouble maintaining her body heat and started bleeding internally. Unfortunately the vet had no definite answers as to what caused it. Although we only had her for 5 short months we cherished every moment we had with her as looking at her sweet face you couldn't help but smile. She was always ready to give kisses or receive belly rubs. Georgia Peach will be truly missed by us all. We extend our deepest sympathy to the Serda family for the sudden and unexpected loss of their sweet Georgia. 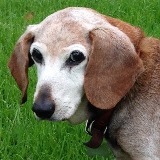 Our special boy, Elliott "Smelliott" Redbud, passed away today. He had numerous health issues, but he lived a happy life during the short time he was with us. 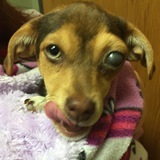 We initially thought he was blind, but it turned out he had some sort of brain damage most likely due to his liver shunt, but possibly from surviving Distemper. Although he was never "quite right", he could be playful and lovable when he wanted to. Elliott's behavior could be challenging, but we loved him anyway. We will miss you terribly, little guy. Run free over Rainbow Bridge.